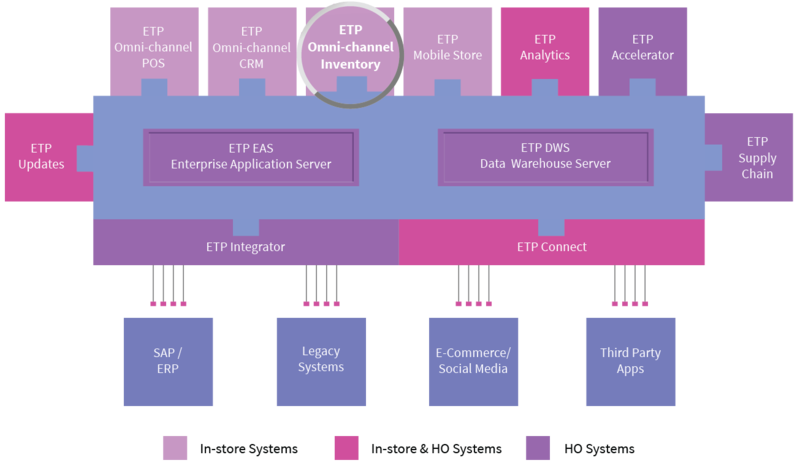 ETP Omni-channel Inventory Management module helps you manage and control the different inventory processes carried out inside stores both for retail sales and online sales. The Stock Transfer function enables you to manage inter-store stock transfers, warehouse to store stock transfer, store to warehouse transfers and direct to store deliveries. With ETP Omni-channel Inventory Management, you can also perform local purchases at the store level. It is a simple and quick process for receiving goods from vendors with reference to order documents. The Stock Take function enables you to perform stock take for a group of items at a time i.e., product-wise stock take. Once the stock take is authorized, the system reflects the difference in stock take (physical stock vs. system stock) in the stock ledger. It also allows physical counting of the inventory offline using hand held device, recording and uploading the same to the application. This reduces the stock take lead time for updating physical count of the store inventory. The module also provides for creating indents for sending inventory requests to warehouses. You can also perform dispatches and stock issues for items with no inventory balance at the store. All in all a well-rounded and robust Omni-channel Inventory Management system.